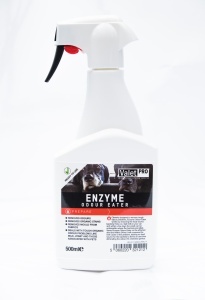 This is an enzyme based odour eliminator which quickly tackles the source of unpleasant smells. It's pH-neutral formulation is safe to use on automotive fabrics, carpets, head-linings & upholstery. Easy to use - spray on, agitate with a brush and vacuum away! Stale and unpleasant smells in car interiors can be difficult to get rid of. Caused by bacteria acting on organic matter, the only effective and long term solution to the problem is to tackle the organic matter the bacteria thrive on. By removing the food source that bacteria thrive on, the smell is removed never to come back. Whilst many air fresheners simply mask the smell, VALET PRO Enzyme Odour Eater removes the source, permanently treating the smell. VALET PRO Enzyme Odour Eater is designed to remove bad odours from dogs, milk, sick, urine and many other sources. Once sprayed on the effected area enzyme is produced which compete with the bad bacteria (which cause the smell), by removing the food source which the bad bacteria thrives on. VALET PRO Enzyme Odour Eater will also remove organic staining caused by things like tea, cordials and even blood (we won't ask where it comes from!). We recommend diluting to 1:5 but its also safe to be used neat.